The Chapter will be providing baked chicken, non-alcoholic beverages and tableware. Members are invited to bring salads, side-dishes, desserts, and other beverage options to share. Please join us for what is always a fun get-together to celebrate another great year for Audubon in the Valleys of the Umpqua! 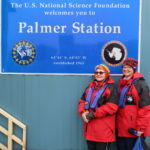 Program: Beth Brown and Diana Wales will share a few photos, videos and stories from their recent trip to Antarctica.